This video and article briefly show the reasons behind the current tension between Spain, NATO allies and fellow EU members. The deeper, underlying issues though are all fundamentally rooted in the complex local political geography. As an exclave of the UK on a peninsula connected to the Spanish mainland that controls access to the Mediterranean Sea, there is naturally going to be friction over this unusual political configuration. Spain, in what the chief Minister of Gibraltar calls “sabre-rattling,” is flexing its muscles and considering using their border and airspace as a political leverage. 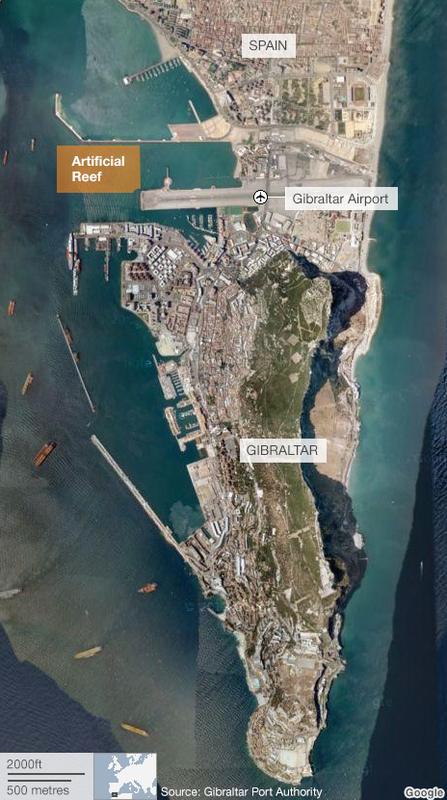 Spain is upset that Gibraltar has created an artificial reef in waters that their fishermen use. Spanish fisherman have recently condemned the escalating political rhetoic. Questions to Ponder: Why are both parties politically and culturally invested in this piece of territory? What challenges are there for a small exclave when neighbors aren’t friendly? How does Spanish and British suprantional connections impact this issue? Tags: borders, political, territoriality, sovereignty, Spain, Europe, autonomy. Questions to Ponder: Why are both Spain and the UK invested in this piece of territory? What challenges are there for a small exclave when neighbors aren’t friendly? How does Spanish and British supranational connections impact this issue? Tags: borders, political, Spain, Europe.